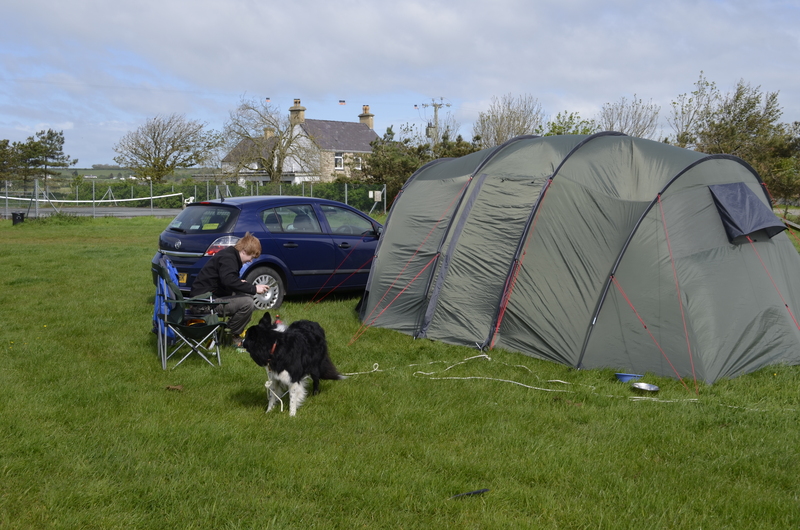 Ash and I set off on Thursday evening for a long weekend camping, with the added luxury of a day of Agility! I’d been recommended the Anglesey show and it was a perfect opportunity to have a nice weekend in the tent as well as get to a new, quiet show. We’d chosen a campsite about half an hour away from the show and set of at 7.30am to arrive nicely for 8am. It was blowing a gail! We had lovely sunshine on Friday but came back from a walk to find our tent sideways, practically flat on the floor (it was a miracle how no poles snapped). 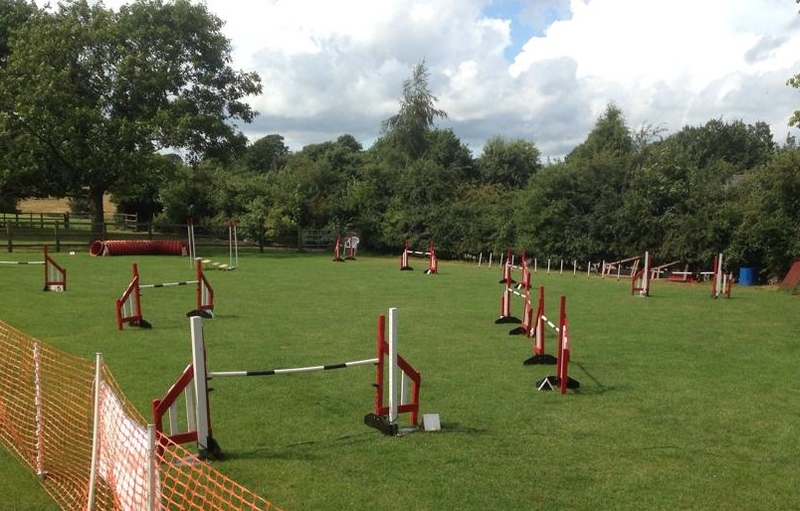 It was no different at the showground, if anything I think it was windier, however the rain was holding off and we quickly got started with G1-2 Agility first up. I considered this my most important class and I opted to run start. All started well and I pulled off a nice rear cross on the a frame with strong contacts. A tricky round-the-back from the dogwalk while calling away from the tunnel and then three jumps diagonal to rear cross the seesaw (mind your chin) then another round-the-back into the weaves. Yes, he’d done the weaves, then across a box and ARGHHHH!! He turned left in the box toward me and took the wrong jump. Nooooo. Even the judge looked gutted for me. A nice 270 and finish. Man!! I thought we had it in the bag. He drove into the weaves so nicely and did 6 lovely, we were on for a winner. But I was holding back from the weaves to ensure I didn’t rush him and I ended up so far behind! Never mind. I am so so pleased, that is the best run we have had at a competition for a while, lovely contacts, nice handling (if I do say so myself), only slips up were we got a little stuck on the diagonal and he turned the wrong way from the seesaw, but overall very good. Plus no knocked poles! A long break now as the next two runs weren’t until after lunch. The day got a little slow and we were very glad of the company and hospitality of Kev, Adele and Avril. 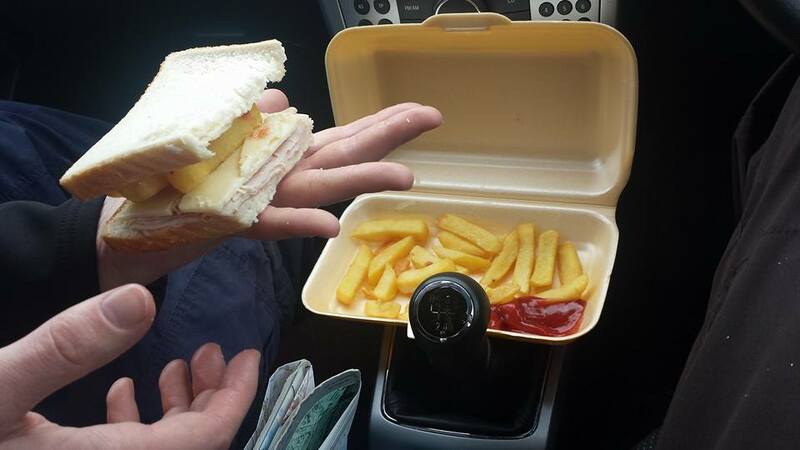 We settled down in the car for lunch of homemade ham & cheese butties and chips! Nom. G1-3 Jumping next and I choked down a miss-timed brew and only managed to walk half of it before they were calling to clear the course. Damn. I went away and quickly drew the course (a technique I’m really getting along with) and studied it on paper. Into the ring and I got Guinness tugging outside of the queue and then kept it up nicely before our run. We went for a wait, nervously, and managed a step away before he leapt up and I ran for it. Some nice rear crosses, although he went off course a little and I needed to spin him around to get back on track. Not knowing if we’d been marked for a refusal I ran on, second to last was the weaves and we powered over the finish! Had we been given a refusal?? I looked at Ash and Kev who raised their arms and said “Ah what happened to the weaves!”. “What did happen at the weaves?! Did he mark our refusal? !” I said. No refusal but apparently Guinness missed his last weave! Aw. I hadn’t even noticed. Gutted. We had all got so excited, another fantastic run yet a fall at the second to last “hurdle” again. Gutted. Phew! This was exciting. It was really feeling like the final Agility was going to be ours. As we walked the Combined 1-3 Agility the heavens opened! With the wind blowing even stronger the rain came sideways and we were soaked through in no time. It didn’t last long and luckily went off just before our run. At lunchtime they had finally decided to take out the dogwalk, a sensible decision, but it left the course lacking a little imagination in places… jump, a frame, jump, wing wrap, a frame, jump. The queue was a bit manic with everyone trying to get their run done to go home. It was far from relaxing. The person queuing in front of me and I spread out and took the queue in a wide circle to keep some distance from the ring, but then the person queuing behind ended up in front of me, which left Guinness surrounded by three dogs. As we entered the ring I had Guinness tugging on his lead nicely which is a great achievement, but as I unclipped his lead a spark of nerves struck me and I grabbed his collar. I don’t know what came over me, despite the queue we were on track to go for our wait but this run was “important” and I didn’t want to risk a Guinness-bog-off-special. As I grabbed his collar Guinness tried to make a runner and freaked out on me (he isn’t a fan of sudden collar grabs) and after a quick pause we set off and knocked the first pole. The rest of the run went in the same style, but I managed to get my head back on as we reached the seesaw and held his contact. I was impressed to see he stayed on it (totally expected him to break) and then nice 6 weaves at speed followed. Always taking positives, we also did a lovely wing wrap, but other than that a potty run! Disappointing end! Ah well. As I drove away I was kicking myself. I am in such a rush to win out of Grade 1 I am sacrificing my waits. Something that is much more important! I’m rushing toward a short-term goal and spoiling the long term goal. I think I’m ashamed to be in Grade 1, especially as I have started teaching classes, yet I am confident in my teaching and handling ability, plus it is only a matter of time before we get that first win. If I look at my true feelings I am more ashamed about becoming someone without a wait than I am of being in Grade 1… so I need to get a grip and sort myself out! 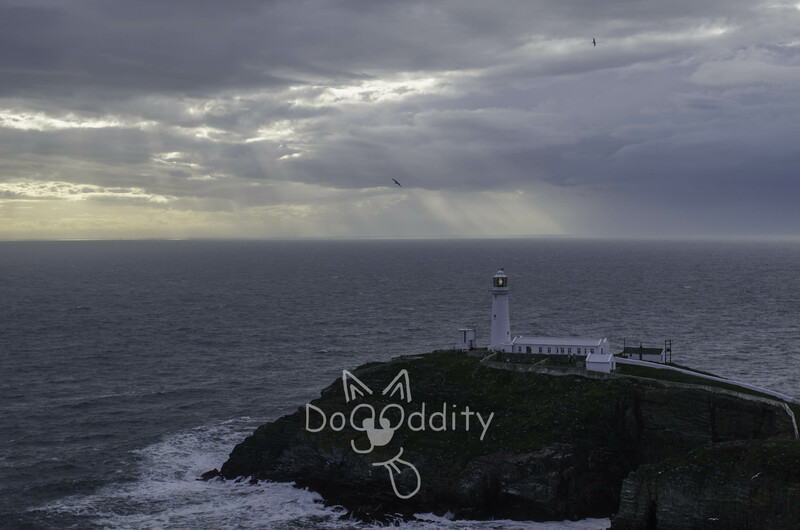 Off to Holyhead, we finished the day with takeaway pizza and a visit to South Stack. The whole weekend was very enjoyable. We had a lovely walk through Newborough Forest and a visit to the beach on Friday and a cup of tea by the seaside and a pit-stop at Snugbury’s on the way home today. The Anglesey Show is a lovely, quiet, two ring show in a nice venue. I was pleasantly surprised to see a lot of friendly faces and it felt geared towards the lower grade dogs. With Beacon being the main show this weekend it certainly seemed that the more relaxed handlers had chosen this show. Plus I hear it was just as windy back home and no one can control the weather.